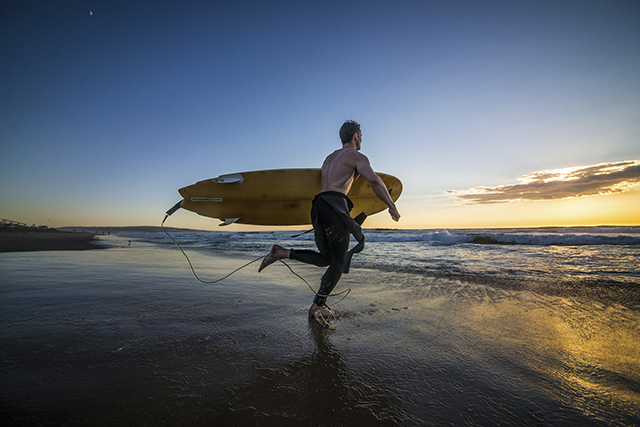 How Important Is Physical Fitness For Surfing? Surfing is fun and is supposed to be fun. It is a great sport. However, if you are not in good physical condition, you will end up disappointed and not have fun. First off, if you are not in good shape for paddling, you will have a difficult time paddling your surfboard out through the incoming waves to get out to the spot where you can start catching waves. The paddle out to the best spot in the lineup to catch waves can be anywhere from fifty yards to four hundred yards. If you are exhausted when you get out in the lineup, you will have to spend good surfing time resting instead of catching waves. Chances are you might not even make it out there. With surfcomp apps we can now all watch the live scores online for any surfing competitions. Some of you will be so out of shape that you will not be able to get through the incoming surf and will be forced to turn around and go back to the beach where you started. That doesn’t sound like a successful fun day of surfing. I was once told that “couch potatoes don’t make it in surfing”. That really makes sense. This probably applies more to part time surfers because many surfers surf all year around. However, even the year around surfers have to stay in training to realize their maximum potential for a good surfing experience every time they go out. Surfers need to stay motivated and keep themselves in good physical condition because you know that when the good surf comes you will be ready. What this means is that when there are days and sometimes weeks with no surf, you need to stay in the gym lifting weights, stretching, working on their core muscles and doing your cardiovascular training. One good way to stay in good physical condition is to have a workout partner. Ideally your workout partner will be one of your surfing buddies and you will be able to motivate each other. If you get bored with the gym, go to the nearest body of water and go paddling and go running. This will keep your shoulders and cardiovascular system in shape as long as you spend at least a half hour of strenuous paddling on your surfboard, paddleboard or SUP. Don’t take the easy way out. Stay disciplined. I think that you should all find something that gives you the inspiration to keep in shape so that when the good waves arrive you will be ready. Personally, my inspiration is thinking about getting in the water with good waves to surf and then surfing like a champion. For some of you, your inspiration could be the motivation of competition with your surf buddies and your desire to be better than they are. For others of you, you get your inspiration from watching surf movies and imagining that you are riding the waves. Then there are others who just want to make sure that they are in good physical condition and that’s what they do, they stay in good condition all year around. Another very important aspect for your surfing success is the food you eat and the sleep you get. Good food and lots of sleep are a must. Healthy eating will make sure that you keep your weight under control, keeping the fat down and your muscles in good shape. Eight hours of sleep is recommended to give your body a chance to recover from the prior days activities and prepare you for the next day of hopefully good surf. You need these two items to insure that you are in good physical condition for your surfing fun and success. One simple recommendation I will give you is to eliminate sugar, processed foods and wheat from your daily intake of food. Physically, you can do chest and shoulder exercises along with setups and cardio. Be aware that your physical condition is a very important part, if not the most important part, of surfing. If you ignore staying in shape, you will not enjoy one of the best sports in the world. It will become drudgery and you will eventually gravitate back to the couch or some other activity that is nowhere near the fun you would have if you were surfing. No matter what sport you take up, you have to be in good physical condition. Another thing is that you also have to be in good mental condition. If you know that you are going to surf and you are going to be exhausted from paddling before you surf, your mental approach to surfing will be bad. You need to be excited every time you surf. Being in good physical condition, having good waves to surf, and having a good mental attitude will make your surfing session a fantastic experience. You will be stoked! There are a couple other things that need to be addressed that have to do with your physical conditioning. They are stretching and hydration. You need to be limber and all stretched out. It is important that you stretch your whole body every day, especially before you go surfing. Keeping your body hydrated is also very important. Your body is approximately 66% water. You have to keep the water level up. It is very important that you drink lots of water every day. It keeps your whole body including your brain in good shape. Forget the cokes, alcohol and caffeine and stick with lots of water. The last part of the puzzle is having proper equipment. If you spend the time getting yourself in good physical condition, then it makes sense that you should have the proper surfboard type and design to perform at your top level. It takes a strong commitment from you to get in shape, so make a commitment to getting yourself the proper surfing equipment. Surfing is supposed to be fun. Get yourself in great physical condition and go do it! Take this enjoyment you will get from surfing and apply it to your everyday life. Always remember to Surf Life! Oak Street Surf, [http://www.oakstreetsurf.com], is an online surf shop representing the latest surfboard products. Log in and get a good review of top of the line surfboard types and designs including bodyboards, skimboards, SUPs and custom longboards and shortboards. You can talk with Chuck to discuss in detail the various options for you to ensure that you select the proper surfboard type and design that will bring you surfing fun and success. He is also a physical conditioning expert and can help you with your physical conditioning program for surfing. Visit Oak Street Surf at [http://www.oakstreetsurf.com], the one-stop online surfboard and surfing equipment store, to find out more about surfboards, surfing, Standup Paddleboards, and what types and designs of water sports products are available. You will be able to talk to the experts with over 70 years of surfing experience.